Why are qualitative assessments and quantitative data combined? How is the subjective bias confronted? 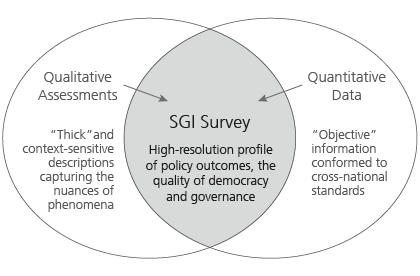 The assessments of the SGI’s Expert Network - inherently subjective - undergo a six-stage peer review within a concise framework. This thorough process ensures the validity and reliability of expert assessments. How does the survey process work? The first country expert writes a draft country report and provides scores on a scale from 1-10. His or her work is based on the Questionnaire. The second expert reviews this report, making comments and providing alternative and complementary content. He or she also provides scores independently of the first expert. The Coordinator mediates between the two experts, ensuring a balanced report. Drawing on his or her regional expertise and the experts’ scores, the coordinator then provides his own scores. The eight coordinators meet to inter-regionally calibrate assessments. Each coordinator is required to explain, defend, and if necessary, recalibrate his assessments and scores. The Advisory Board, comprised of renowned scholars and practitioners, discusses and approves the final scores. The Advisory Board is also entitled to make strategic decisions for the SGI. The reports are subjected to a rigorous editing process, in form and content. Questions that arise are checked with the coordinators and experts. Final reports are published at sgi-network.org. How are scores weighted and aggregated? Combining the qualitative expert ratings with quantitative data yields the Survey Structure. In order to aggregate the indicators into composite indices, the quantitative indicators (which use varying scales and units of measurement) are standardized via a linear transformation. Long-term data series were used to set appropriate minimum and maximum values and calculate scores from 1 (worst) to 10 (best). To see the weighting schemes applied, go to Economic Policies, Social Policies, Environmental Policies, Quality of Democracy, Executive Capacity or Executive Accountability. On these pages, you also can apply your own weighting schemes (”My Ranking”). How is the SGI country sample composed? The SGI examines 41 countries. The following illustrations show all sample countries according to their membership in the OECD, EU and eurozone, respectively.